Center Café offers hand-crafted coffee drinks from Oak Cliff Roasters, along with breakfast pastries and fresh pressed juice from The Juice Bar. Lunch selections feature a choice of sandwiches prepared with artisanal breads and salads created from locally sourced farmer’s market produce. Packaged in grab-and-go containers, a farm-to-table lunch from Center Café is as convenient as it is healthy. 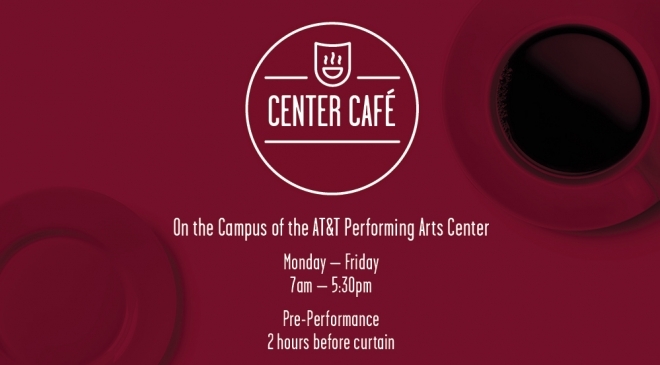 Center Café offers pre-performance bites featuring artisanal charcuterie and cheese to share and house made brownies. Wine and beer are paired as the menu changes. If you are interested in hosting an event at Center Café, we would be delighted to accommodate your group as a private event. For further information, please contact Dana Blaugrund at 214 868 3262 or Dana.Blaugrund@wolfgangpuck.com.